The NUTS is the official division of the EU for regional statistics. 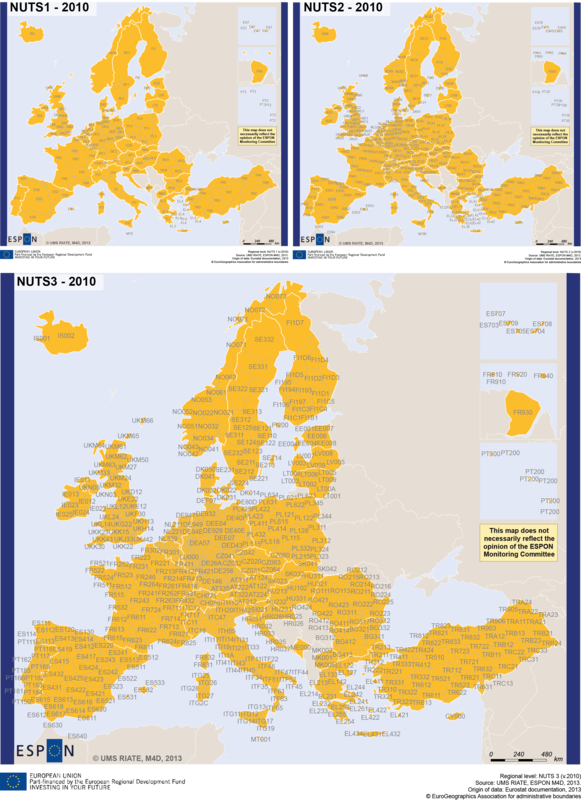 At the beginning of the 1970s, Eurostat set up the NUTS classification as a single, coherent system for dividing up the EU's territory in order to produce regional statistics for the Community. For around thirty years, implementation and updating of the NUTS classification was managed under a series of "gentlemen's agreements" between the Member States and Eurostat. Work on the Commission Regulation (EC) No 1059/2003, to give NUTS a legal status started in spring 2000. This was adopted in May 2003 and entered into force in July 2003. The regulation also specifies stability of the classification for at least three years. Stability makes sure that data refers to the same regional unit for a certain period of time. This is crucial for statistics, in particular for time-series. However, sometimes national interests require changing the regional breakdown of a country. When this happens the county concerned informs the European Commission about the changes. The Commission in turn amends the classification at the end of period of stability according the rules of the NUTS Regulation (). This figures shows the history of the NUTS nomenclatures (Source: Eurostat). All the "official" versions of the NUTS nomenclatures are supported by the ESPON Database (versions 2003, 2006, 2010). On top of that, the NUTS 1999 version has been also integrated. In that order, it is possible to query both the datasets produced within the ESPON 2006 Program (datasets available in the NUTS 1999 and the NUTS 2003 version) and the ESPON 2013 Program (datasets available in the NUTS 2006 and 2010 versions). 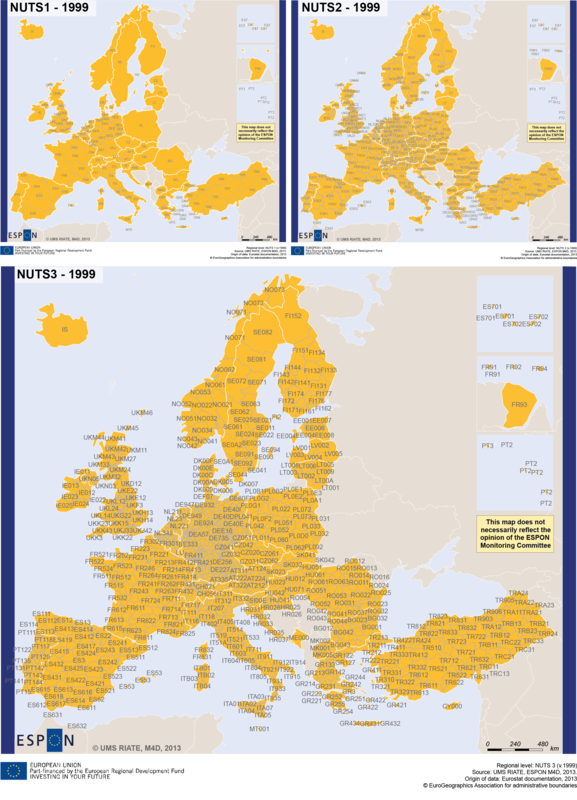 ESPON Projects have produced datasets from the NUTS 1999 to the NUTS 2010 version: to summarize, the ESPON 2006 Program has provided datasets in the NUTS 1999 and the NUTS 2003 versions; the ESPON 2013 Program in the NUTS 2006 and the NUTS 2010 versions. All the key indicators produced by the ESPON Projects of the two programming periods must be available under the Search interface of the ESPON Database. The ESPON Program takes care of the current political situation in the European Union: in other terms, it makes no sense to integrate territorial units for the EU15 only in the NUTS 1999 version since the European Union is constituted by 28 Member States in July 2013. The study area of the ESPON Program for regional analysis is EU28+4 (EFTA Countries), plus possibly Candidate Countries: it implies necessarily to combine in the ESPON Dataset the NUTS nomenclature, which is official and regional nomenclatures coming from gentlemen agreement for EFTA and Candidate Countries. A table structured by country covering the ESPON Area and the Candidate Countries. It explains for each NUTS version what is the reference document displaying the territorial units in the nomenclature. The contact persons concerning the building of the ESPON NUTS nomenclature are Nicolas Lambert, UMS RIATE (<nicolas.lambert@ums-riate.fr>) and Ronan Ysebaert (<ronan.ysebaert@ums-riate.fr>). The following spreadsheet proposes the complete description of the extended ESPON NUTS 1999 classification: nomenclature.xls. See also . This section proposes an overview ot this nomenclature definition: Table 1.1 details the source reference structured by country, the maps in Figure 1.2 show the meshes of this nomenclature version for levels 1, 2 and 3. Figure 1.2. ESPON NUTS division 1999 at levels 1, 2 and 3. An extract of codes has been put on the layer in order to have a global overivew of the differences with the other NUTS versions. The following spreadsheet contains the complete description of the extended ESPON NUTS 2003 classification: nomenclature.xls. This section proposes an overview ot this nomenclature definition: Table 1.2 details the source reference structured by country, the maps in Figure 1.3 show the meshes for levels 1, 2 and 3. Please find below a list of the main changes compared to the ESPON NUTS 1999 Version. The complete list of changes is available in the sheet entitled changes of the document nomenclature.xls.. Creation of Extra-Regio for each country (code=ATZZZ for instance). Creation of a hierarchical system of code for each country (at NUTS 3 level, "LT" become "LT000"). DE3/DE4/DE9: Unit merge or split. IT: Code change, merge and split. PT: Code change, merge and split. FI: Code change, merge and split. PL: Code change, merge and split. LV: Code change, merge and split. BG: Code change, merge and split. Figure 1.3. ESPON NUTS division 2003 at levels 1, 2 and 3. The following spreadsheet document contains the complete description of the extended ESPON NUTS 2006 classification: nomenclature.xls. This section proposes an overview ot this nomenclature definition: Table 1.3 details the source reference structured by country, the maps in Figure 1.4 show the meshes for levels 1, 2 and 3. Below are listed the main changes with the previous version (ESPON NUTS 2003 Nomenclature). For a complete list of changes, please consult the sheet entitled changes in the document nomenclature.xls. DK: Code change and split. DEE: Merge of NUTS3 regions. ITG2: Split of NUTS3 regions. NL222 and NL223: Boundary shift. PL: Code change and split. Sl: Code change at NUTS3 level. FI191 and FI192: Boundary shift. SE: Code change and boundary shift for SE021 and SE025. UKM1 and UKM4: Boundary shift. IS: Split at NUTS3 level. Figure 1.4. ESPON NUTS division 2006 at levels 1, 2 and 3. The following spreadsheet contains the complete description of the extended ESPON NUTS 2010 classification: nomenclature.xls. This section proposes an overview ot this nomenclature definition: Table 1.4 details the source reference structured by country, the maps in Figure 1.5 show the meshes for levels 1, 2 and 3. Below are listed the main changes with the previous version (ESPON NUTS 2006 Nomenclature). For a complete list of changes, please consult the sheet entitled changes in the document nomenclature.xls. DE4, DED, DEA2: Code change and merge. ITD, ITE, ITF, ITC4: Code change and boundary shift. FI13, FI18, FI1A: Merge of units at NUTS3 level and code change. UKD2, UKD5, UKE43, UKF23, UKG34, UKG35, UKH22: Code change and boundary shift. Figure 1.5. ESPON NUTS division 2010 at levels 1, 2 and 3. In July 2014, some codes of the spatial units in Croatia have been updated in this Nomenclature NUTS 2010. The codes referenced in  as HR01 and HR02 become HR04 in the updated version. More precisely, the Table 1.5 describe the changes.